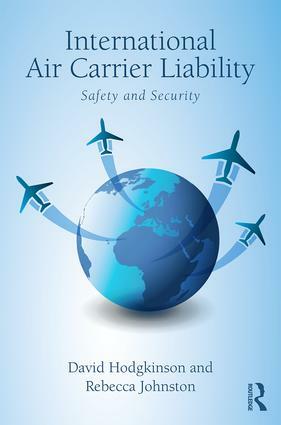 International Air Carrier Liability brings together essential treaties and airline-to-airline agreements on air carrier liability, safety and security, and supplements these with expert commentary and analysis. The examination considers the general regulatory framework of international civil aviation (including the Chicago Convention and related documents) and how the liability regime fits within that framework. The book is divided into three parts: dealing in turn with liability, safety and security, and civil aviation regulation. Part I, for example, provides comment and analysis of the international air-carrier liability regime, how the main liability conventions operate, and the application of these conventions to international carriage by air (passengers, baggage and cargo). Given its subject matter and the universal state party participation in these conventions, this book has truly global application. David Hodgkinson and Rebecca Johnston aim to provide a reference aid for legal practitioners (at law firms, airlines, manufacturers, aviation-related corporations and government departments and agencies), as well as academics, students (undergraduate and post graduate) and government officials regarding treaties, domestic laws and documents concerned with these vital legal issues. David Hodgkinson is a partner at HodgkinsonJohnston, an Australian aviation and aerospace law firm. David is also an associate professor in the Faculty of Law at the University of Western Australia. Rebecca Johnston is a partner at HodgkinsonJohnston. She is also an adjunct lecturer in aviation law at the University of Notre Dame Australia, School of Law.